Low voter turnout in major elections remains a huge issue in the United States. The 2016 Presidential Election saw a 55.7% voter turnout – ranking 26th internationally when compared to recent general elections in 32 other highly developed, democratic nations. One of the most common reasons cited for low turnout is the lack of time registered voters have on Election Day (always a Tuesday) to actually vote. Many younger professionals are unable to excuse themselves from their jobs to cast a ballot. However, many states have laws in place that enable registered voters to take time off to vote on Election Day. Because this information is, unfortunately, difficult to find for some states, we compiled every state’s laws into one convenient, interactive visual format, along with other information relevant to voter’s rights in the workplace. 29 states have laws giving registered voters the right to take time off work to vote on Election Day. Of those 29 states, 22 require paid time off be given to vote. 18 of those states require advance notice to take time off to vote, and 5 of them require proof after you have voted. 12 states allow employees to take time off with no advance notice at all. 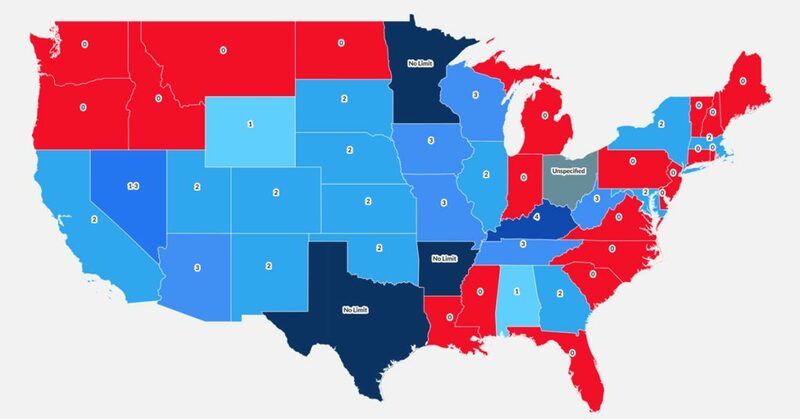 Interactive Map: Which States Allow Employees to Take Time Off From Work to Vote? Hover over each state for more information. Note: If you are on a mobile device, rotate device for best experience viewing this map. You can also pinch and zoom in and out of the map. More than half of the states in the United States require businesses to give you time off to vote on Election Day. It is important to note, however, that advance notice is required in 18 of these states – and can vary from a verbal notice one day prior to a written formal request at least three days before the election. Of these states, 22 require that any time taken to vote must be paid. The specific amount may vary from state to state, ranging from one hour to three consecutive hours. Some states may have provisions that allow employers to specify an exact time they may be excused, while others may simply require employers to give “a reasonable amount of time” to vote. Please consult your employer to determine what qualifies as adequate proof that you have voted. Hawaii Haw. Rev. Stat. § 11-95 Yes Two consecutive hours Paid No Yes. Employee must show voting receipt or employers may deduct hours off from pay.